MANILA, Philippines - State weather bureau PAGASA in an update released as of 11pm on Saturday night, December 6, 2014 said that Typhoon Ruby (Hagupit) has made landfall over Dolores, Eastern Samar at 9:15pm and is now heading towards Masbate. The expected second landfall of Typhoon Ruby is on Sunday afternoon (December 7) in the vicinity of Masbate and it will be associated with strong winds, storm surge (up to 4.5 meters) and heavy to torrential rainfall. The estimated rainfall amount is from 10 – 30 mm per hour (heavy – torrential) within the 600 km diameter of the typhoon. 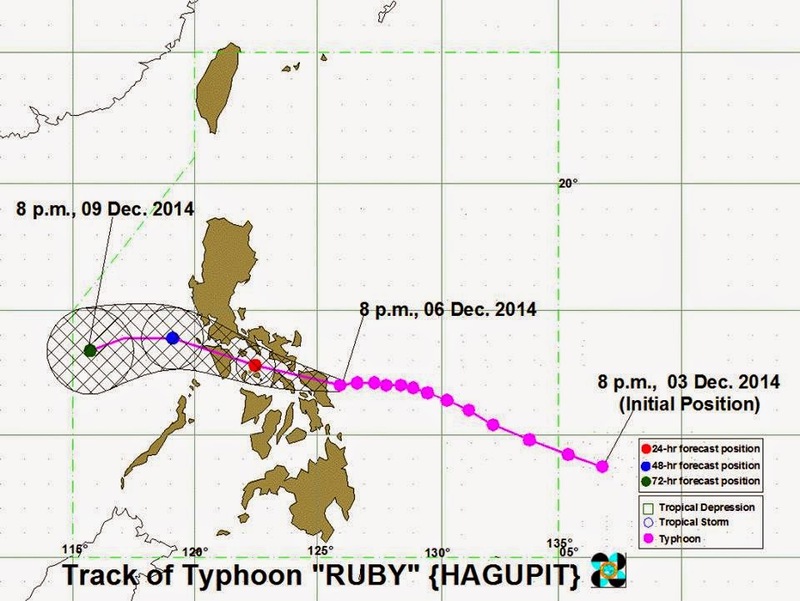 'Ruby' is expected to exit PAR on Tuesday evening (December 9). At 10:00 PM today, the eye of Typhoon 'Ruby' was located based on all available data including Virac and Cebu Doppler radars in the vicinity of Dolores, Eastern Samar or at 140 km East Southeast of Catarman, Northern Samar (11.9°N, 125.8°E). 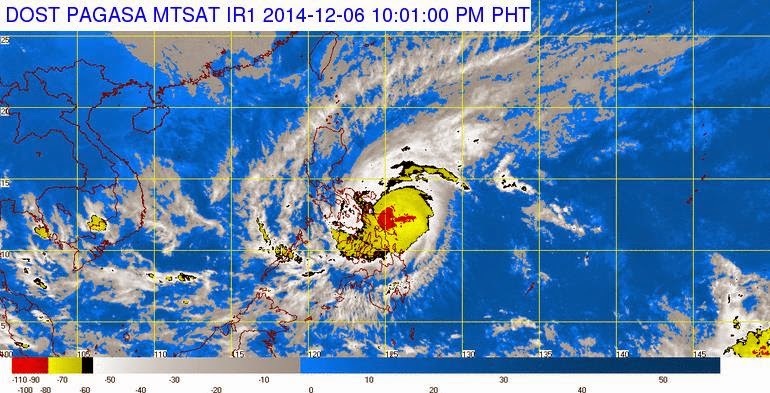 It has maximum sustained winds of 175 kph near the center and gustiness of up to 210 kph. It is forecast to move West Northwest at 15 kph. 24 hour (tomorrow evening): 35 km Northeast of Romblon, Romblon. Residents in low-lying and mountainous areas are alerted against flashfloods and landslides. Likewise, those living along the coast are warned on the occurrence of big waves associated with Storm Surge which may reach up to 4.5 meters. LUZON: Camarines Norte, Southern Quezon, Marinduque, Oriental Mindoro and Occidental Mindoro. Residents in low-lying and mountainous areas are alerted against possible flashfloods and landslides. Likewise, those living along the coast are warned on the occurrence of big waves associated with Storm Surge which may reach up to 3 meters.